Easily change your hair color to match your outfit, mood, or style for any day or night. With Hair Chalk: Step-by-Step illustrated instructions + 12 Easy to Follow Hairstyles, you can design your own look from the many styles within to express your individuality. This kit includes twelve two-and-a-half-inch hair chalks, non-latex gloves, and a 32-page, full-color instruction book to help you get the perfect color every time! Try out different techniques and styles like monochromatic, ombre, mermaid, full-spectrum rainbow, and more that you can wear to prom, cosplay, Halloween, parties, or a night on the town. Learn to color all types of hair, from white-blond to bleached and treated, to deepest darkest brown. Featuring styles for short, mid-length or long hair; straight, curly, or wavy hair, for people with all hair types. Chloe Sakura has been coloring her hair since age 13. Growing up in NYC she was exposed to club life and the high-fashion of temporary and semi-permanent hair dyes and has been styling her hair (and her friends) ever since. She loves yoga, bike riding and pit bulls, and now lives in a large, sunny house by the sea. Set yourself apart from the crowd and create this really pretty half-up do. Try to make the hair chalk match your dress, or for a bolder statement, go for the contrasting color! This style looks positively regal when done with naturally curly hair. Pull about 1/3 of your hair into a high ponytail and the rest into a low ponytail. Choose three colors for your crown; you might need to use white as a base if you have dark hair. Section off a few strands from the top pony and chalk them, switching colors every two locks. 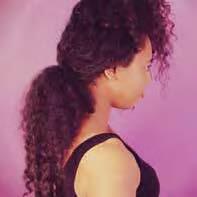 Continue around your head until you have a high ponytail, sections of color, and a bottom ponytail, in that order. Remove the hair tie from the top ponytail, gather the colored sections into it, and twist away from your face and around the crown of your head. 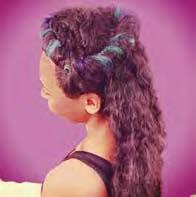 Continue to twist the top section until you reach the other side of your head or run out of hair. Pin the end of the twist under the rest of the hair. Take the tie out of your bottom ponytail. If you want a more casual crown, style the back of the twist lower down and closer to your neck. How many times have we been late for work and didn’t have time to bathe or forgot our deodorant. One thing is for sure, no one wants to be the source of the smell. So, what can you do to curb the eau de you? Inside The Little Book of Home Remedies, Beauty and Health, Linda B. White, M.D., Barbara Seeber, and Barbara Brownell Grogan have some great pointers to help you get smelling fresh. Aromatic appeal is, to some extent, subjective. The sense of smell is primal, mysterious, and deeply personal. Compared to that of most other mammals, our olfactory perception is dull. 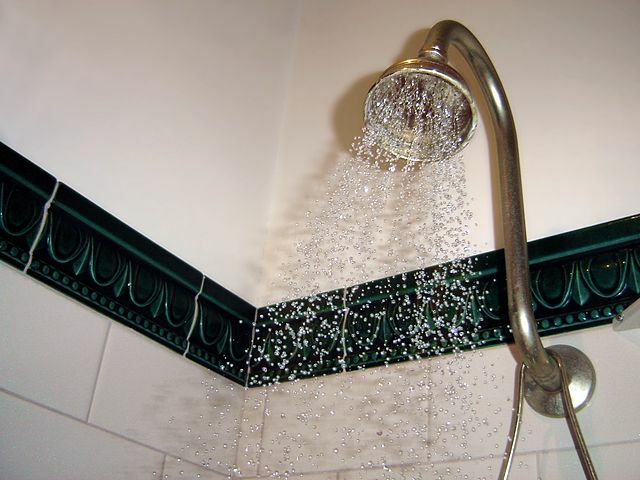 Regular bathing with soap and water is one great way to control body odor. Photo by D. O’Neil, courtesy of Wikimedia Commons. Yet, it remains important for survival. It helps us detect smoke, identify whether food has gone bad, and determine whether we or our clothes need washing. Odor receptors in the nose connect swiftly to deep and ancient parts of the brain, including those involved in strong emotions and memory formation and retrieval. Mothers and babies of all mammalian species recognize one another by scent. Scent figures in our choice of a mate. In fact, body odors provide subconscious information about a potential mate’s genetic compatibility, social status, and reproductive vigor. Fluctuations in female hormones temper a woman’s olfactory sensitivity. What creates a person’s signature aroma? A lot of things: diet, overall state of health, age, emotional state, levels of certain hormones, hygiene, and some medications. Some diseases create characteristic chemicals detectable on skin and in breath. Examples of illnesses that alter skin smells include infectious diseases (for example, tuberculosis and scarlet fever), scurvy (vitamin C deficiency), and schizophrenia. Americans tend to be particularly preoccupied with body odor. The armpits are the usual source. Armpit sweat, which is richer in proteins and fats than secretions from the sweat glands covering most of your skin, doesn’t stink until bacteria that normally colonize your skin break down chemicals in sweat into acids. Using just two pantry ingredients, this recipe is quick, easy, and effective. Essential oils add sweetness to this natural remedy. Mix the baking soda and cornstarch together in a small glass dish. Apply to underarms with a clean makeup pad. Apply to feet and the insides of shoes to sop up foot odors. Recipe Variation: Add 10 to 12 drops of lavender or another favorite essential oil per ½ cup (87 g) of the mixture. Drop the oil into a bowl, pour the powder mixture into a sieve, and shake it into the oil, gradually mixing the two to blend. How it works: Baking soda is a natural odor eliminator. Cornstarch absorbs excess moisture. Warning: Be careful not to inhale the particles. In this giftable mini booklet of The Little Book of Home Remedies, Beauty and Health, Barbara H. Seeber and Barbara Brownell Grogan join Dr. Linda White to draw on years of training in the area of natural healing to help you treat aches and pains and manageable ailments naturally. This handy guide provides remedies and advice for dry skin, acne, dandruff and more. National Geographic editor and award-winning feature writer Barbara H. Seeber is a 30-year veteran of the publishing world. As an editor for National Geographic Books, she helped launch a number of titles in National Geographic’s line of health books. Barbara Brownell Grogan, former editor in chief at National Geographic Books, is also a graduate of the Institute for Integrative Nutrition, in New York City. At National Geographic she grew the health line of publications, including Desk Reference to Nature’s Medicine, Body: The Complete Human, Brainworks, and Guide to Medicinal Herbs, and has worked with health and well-being experts including Joe and Terry Graedon, of The People’s Pharmacy, among others. Make Your Hair Pop with Temporary Chalk! 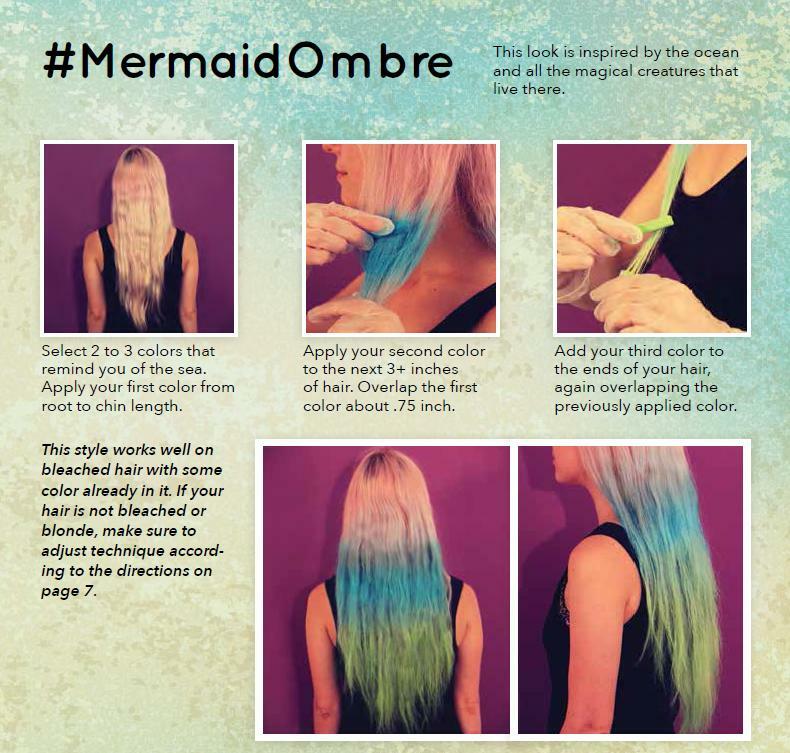 Want to give your mane a temporary pop of color? Hair chalk is a great, safe way to give your hair a cool, bendable, ombre look without the permanence of dyes or bleach. Even if you have dark hair, you can still get a vibrant look! But what will you need to get the results that you’re looking for? We’ve got the list right here from Hair Chalk: Step-by-Step illustrated, an all-in-one kit. A smock or old clothing: hair chalk can be messy to apply and easily comes off on your clothes. 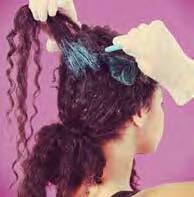 When chalking your hair, wear a smock or a towel over a dark shirt. Wait to put on your fancy outfit until after your hair is done. 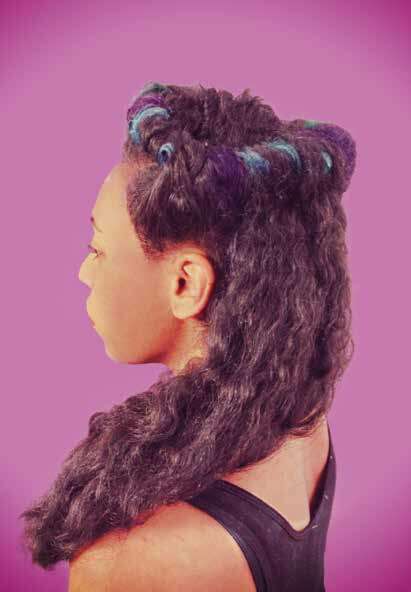 If your hair is not completely pulled up, make sure you only chalk the top layer. Start with clean, tangle-free hair. Make sure your hair is well moisturized with conditioner when you wash it, and use an oil afterwards—jojoba, vitamin E, and argan oils are all good examples of natural moisturizers. Don’t worry if you have naturally oily hair; follow these steps anyway–your hair will thank you for it. Make sure your hair is completely dry, combed out, and tangle-free before adding color and styling. Before you do any chalking, get your workstation ready and cover any surface that you don’t want to get chalky and colorful. Put on a pair of disposable gloves so that your hands remain clean while coloring and styling your hair. 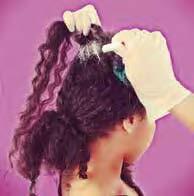 Fill the spray bottle with lukewarm water so that the water is comfortable when it touches your scalp. Make sure your hair is completely dry; otherwise, the color will stain the hair shaft and take a lot longer to come out than one shampoo and rinse cycle. Choose a lock of hair that you want to chalk. 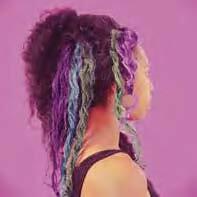 Twist the lock and apply the hair chalk in a downward motion only. Do not rub the chalk up and down the hair, as this can cause split ends. 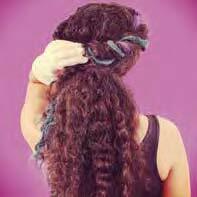 Untwist the hair and continue chalking any lighter patches. Chalk as many locks as you want in as many colors as you want to create rainbow streaks. Set the color with a curling or flat iron. Experiment first by chalking a dry lock of hair (see instructions above for light-colored hair). If the color is not showing up, lightly mist both the lock of hair and the stick of chalk with water from the spray bottle. Twist the lock in one direction and apply the chalk in a downward motion, moving the chalk from root to tip helps prevent split ends from forming. Continue to chalk your hair until you have achieved the desired amount of color. Wait for your hair to dry naturally. Use a curling or flat iron to set the color. Try layering matching colors at the ends of your hair to create funky tips! Fill a cup two-thirds full of water and drop in your chosen chalks for five to ten seconds. Wet your hair with a spray bottle but don’t soak it through. Twist a lock of hair and apply the chalk in a downward direction (don’t rub the chalk up your hair because it can cause split ends). Release the twisted hair and make sure the chalk is evenly dispersed through-out the lock; you may need to add more chalk. Add as much chalk to your hair as your desired style requires. Wait for your hair to dry on its own; air-drying your hair allows more pigment to stay in, as a blow dryer may blow some pigment chalk out. Hair chalk is dry by its very nature, and will soak up most of the moisture in your hair. The color will set better if it is heat treated, so you may want to use a flat or curling iron. If those options are too damaging for your hair type, hair spray will also work. We’ve heard from stylists and skin experts that skipping a shampoo is beneficial to your hair’s overall health. Some of us can go days or weeks without sudsing up our locks, but a sometimes we need a little help. Dry shampoos are a great alternative to washing your hair every day, and this all-natural alternative to the commercial sprays is super easy to make. 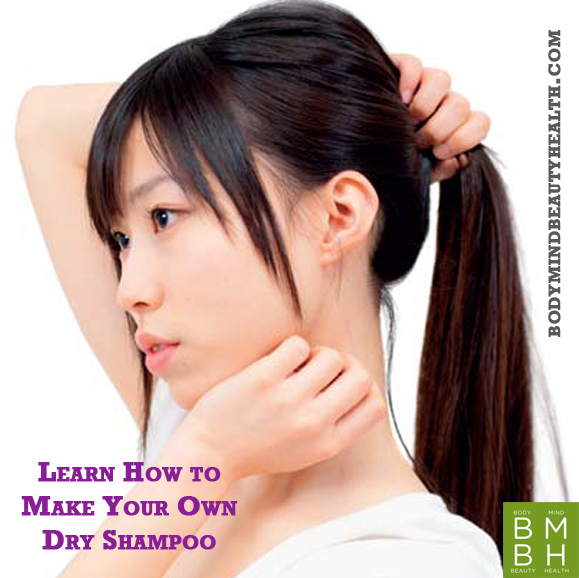 Dry shampoos: These make brilliant “quick fixes” for dirty hair. Dry shampoos are waterless and contain dry ingredients such as cornstarch, arrowroot powder, clay, and even rice powder. A small amount is sprinkled over the scalp and either massaged into or combed through the hair to soak up oil, remove dirt, and even boost volume. Dry shampoos are regularly perfumed with aromatic essential oils to eliminate odors. They can be used daily. Powdered, dry natural ingredients, such as rice powder, arrowroot powder, cornstarch, oat powder, tapioca starch, kaolin clay, cocoa powder, horsetail powder, orris root powder, and baking soda can be combined with small amounts of essential oil to cleanse the hair without using any water in order to make the hair appear thicker and fuller. Place all of the ingredients into a blender or food-processor, and process until well combined. Transfer to a sugar shaker with a lid. To use: Sprinkle a teaspoon-sized amount into your hair. Use your fingers to massage into the scalp and roots. Use a bristle brush to comb through your hair evenly. Style as desired.